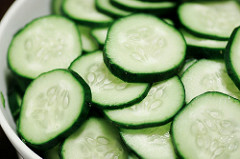 Thinly slice cucumbers, add salt and pepper to taste. Mix remaining ingredients together and add the seasoned cucumbers. Serve chilled.